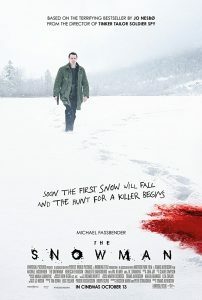 ‘The Snowman’ in Theaters October 20, 2017! Brandon finishes recording the score for The Snowman at London’s Air Studios with Marco Beltrami! Featuring Michael Fassbender and Rebecca Ferguson, the movie premiers in theaters on October 20th. Based on the novel of the same name, the film follows detective Harry Hole as he connects decades-old cases to outwit an unthinkable evil. The Snowman features additional music alongside composer Marco Beltrami.